Thank you for reading Clint's Newsletter. We will be producing the newsletter quarterly and on special occasions. Never miss an issue, make sure to sign up now and this with a friend. I would like to applaud General Rothstein for his time as the Commander of the 56th Fighter Wing at Luke Air Force Base (AFB). 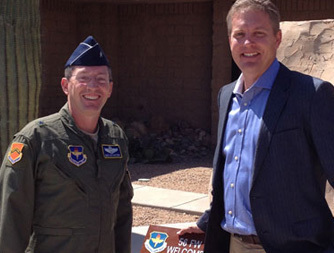 He will soon have a change of command that will require him to leave both Luke AFB and his family to fulfill his new command. For me, the final test of a leader is that he leaves behind him, in others, the conviction and will to carry on. By that measure, General Rothstein ranks with the great leaders of our nation and our community. His military service at Luke concludes in much more than a job well done. He has a grateful community that honors him as well as a base command that has the conviction and will to carry on his extraordinary example of leadership. Take time this Memorial Day weekend to remember the many men and women who died while serving in the United States Armed Forces. Some confuse Memorial Day with Veterans Day while others are unsure of the differences between these important holidays. Memorial Day commemorates the men and women who gave their life while serving, whereas Veterans Day celebrates the service of all U.S. military veterans. On Memorial Day, the flag of the United States is rapidly raised to the top of the staff then solemnly lowered to the half-staff position where it remains until noon. The flag is then raised to full-staff for the remainder of the day. The significance of the half-staff position is to remember those who gave their lives in service of their country. At noon, their memory is raised by the living to signify that their sacrifice is not in vain rather their memory rises in continuance of their fight. With a young family of my own, I am always looking for fun things to do with my kids in the district I represent. With the warmer weather upon us, we look to take in programs offered during the cooler times of the day. Fortunately for us, the park offers family moonlight hikes, scorpion hunts, stargazing events and a variety of programs in the air-conditioned nature center. In light of what is transpiring nationally regarding the medical care of our veterans, I urge any veterans, or those who know a veteran in need of services, to visit the Veterans Resources website. Maricopa County has launched this website to provide information about programs and services offered to veterans. The Veterans Portal serves as a single, one-stop clearinghouse that links military veterans to employment, housing, legal information, training, education, wellness, and other services provided by Maricopa County, other governmental agencies, and community organizations. Arizona is an ideal place to grow rosebushes. As such, the majority of the rosebush crop is grown in Arizona and only one other state in the Country. Therefore, it is likely that the roses you see and enjoy in gardens throughout the United States originated from Maricopa County.